D-Link | Tech talk got you confused? Here’s the inside scoop on what to look for when buying a router. Your router is the center piece of it all, connecting your devices to each other and to the internet. 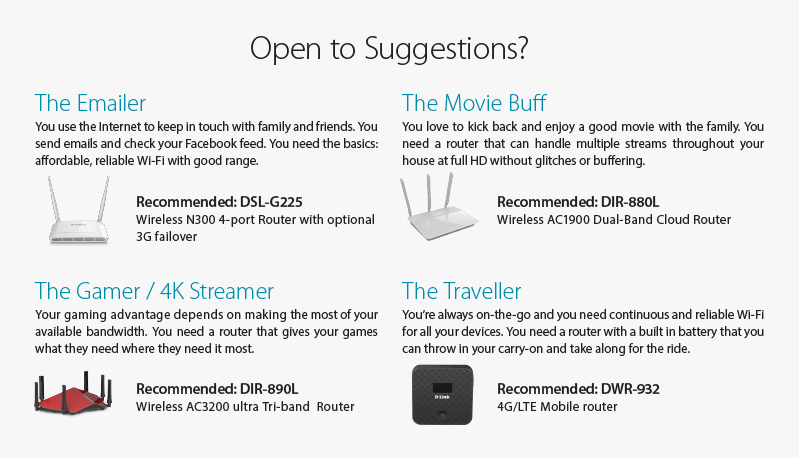 But how do you choose just the right router to meet your individual needs and keep the good times rolling? To help you sort through all the tech specs, D-Link has set up a short guide to help you figure out what to look for in your next router. Making sense of network standard, speed and range. As technology continues to improve so do router’s wireless standards. The latest standard is 802.11ac which means that the router can support up to Gigabit speeds. But take note that the wireless speeds listed are usually the “theoretical” maximum bandwidth and should be used as a guideline. In a realistic environment you’ll rarely see throughput that high due to barriers such as walls and other appliances creating interference. The same applies to range, as it is heavily influenced by environmental as well as mechanical factors such as how many radios and antennas the router has, the frequencies it uses, interference and barriers. Currently Wireless AC routers are 3x faster than Wireless N which is 14x faster than Wireless G. So if you need to stream HD video or use real-time applications Wireless AC is your best bet. Remember however that your router’s wireless speed can’t make your home network’s speed any faster than your actual line speed. How does Wi-Fi signal work and how many bands do you need? In most routers Wi-Fi signals are broadcast in a circular pattern blanketing the area around the router. These days more advanced routers offer smart beamforming technology that finds and tracks devices on your network and aims Wi-Fi signal directly at them to increase signal strength and stability. When a network has many devices competing for connection a dual or tri-band router will allow you to improve your networking efficiency by bumping more important devices to an alternate, less crowded frequency. While dual-band routers have become very useful, tri-band routers are still a little over-kill for the average home. Unfortunately the convenience of wireless networks does make them easy targets for anyone within range, from eavesdroppers to leechers and hackers. It is very important that any router you buy should support WPA2 or at least WPA as unfortunately your network is only as safe as your least-secure device. You should also consider changing your default login password such as admin/admin to something that’s harder to guess! Quality of service (QoS) is a set of mechanisms written into the router’s firmware that optimizes your network’s traffic so the most important applications such as VoIP, online gaming or video streaming receive first priority. QoS ensures your online resources are used in the best possible way. Some newer generation routers also come with D-Link Cloud Services that allow you to access and manage your home network remotely. 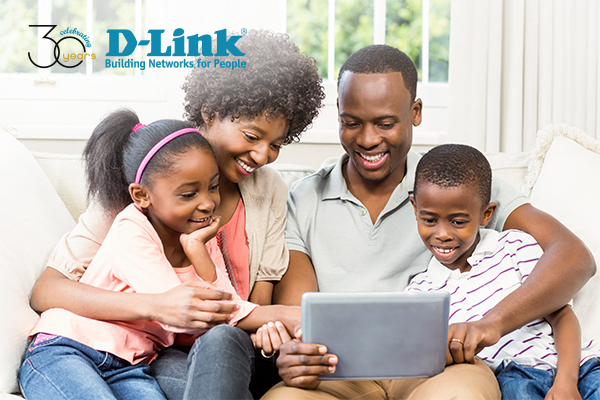 With D-Link’s free mobile app you’ll be able to easily see and block devices connected to your network, check up on your web browsing history and even more. Now that you have some of the tech terminology down, here is a check list to refer back to when you’re in store for that all important purchase as well as a few suggestions.